What happens when you put two great things together? Reese’s Peanut Butter Cups? Peanut butter and jelly? Starsky and Hutch? Citi recently asked this question as part of a social media promotion to create awareness for its new Double Cash Card. 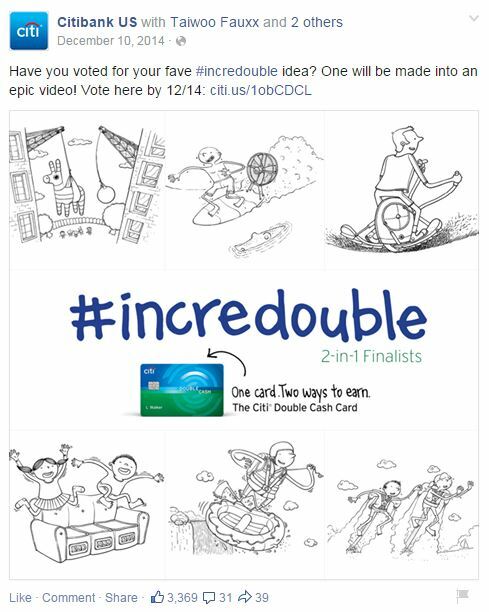 The promotion, simply called #incredouble, asked participants to think of two things that could come together to create something unexpected and incredible. 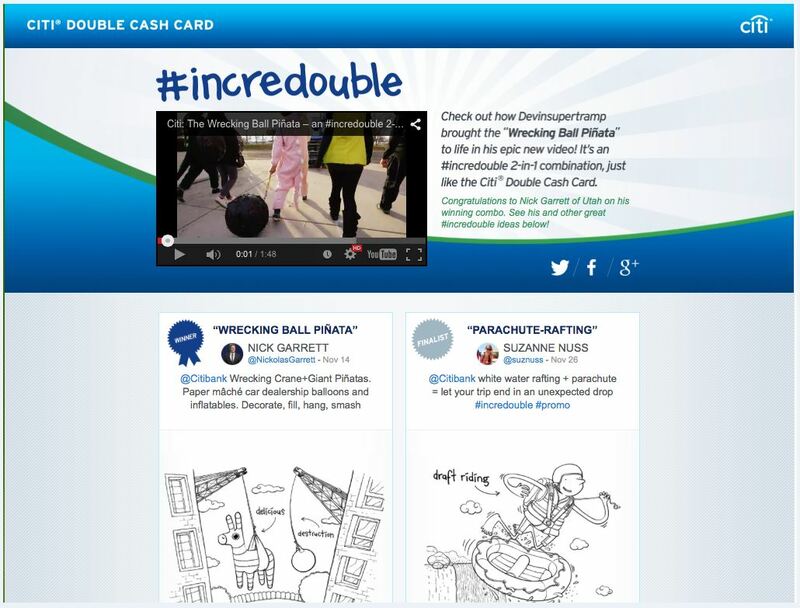 This fun viral promotion builds upon the Double Cash Card’s unique double rewards structure that allows cardholders to earn cash back on both purchases and payments. 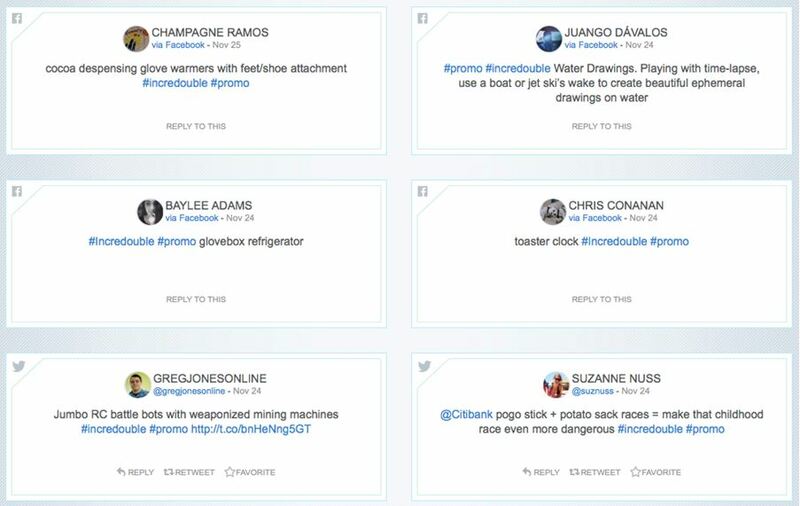 During the month of November, participants shared their ideas over Twitter and Facebook with the hashtags #incredouble and #promo. Entries ranged from the practical (glovebox and refrigerator) to the humorous (slip n’ slide and pool filled with Jell-O) and the bizarre (dinosaurs and donuts). At the end of each week, two entries were selected by a panel of judges. These winners received $2,000, and his or her idea was illustrated and featured on the promotion’s microsite where the public could vote on the grand prize winner. The idea that won the grand prize? The “Wrecking Ball Piñata” – a combination of a wrecking crane with a giant piñata. We like the creative spirit of this promotion, which aligns well with the card’s brand. Many of the entries were fun and clever, which helped encourage retweets and viral possibilities. And by illustrating the top six ideas, as well as creating a video of the grand prize winner, the promotion has legs that extend well beyond the initial contest period. We also like the way the promotion helped create awareness of the Double Cash Card’s earn structure. 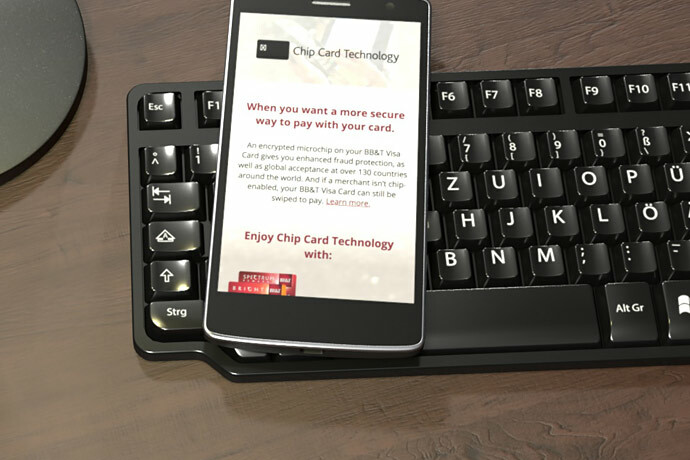 Posts published by Citi included card art with the tag line, “One card. Two ways to earn.” It was a subtle, but effective, way to position the 2-in-1 earn structure as another “incredouble” idea. A TV spot for Capital One’s Quicksilver card grabbed our attention. It was drastically different from the ones we're used to seeing from this credit card issuer. It featured actor Samuel L. Jackson – an unexpected celebrity – and an unexpected (and simple) conceptual thrust. 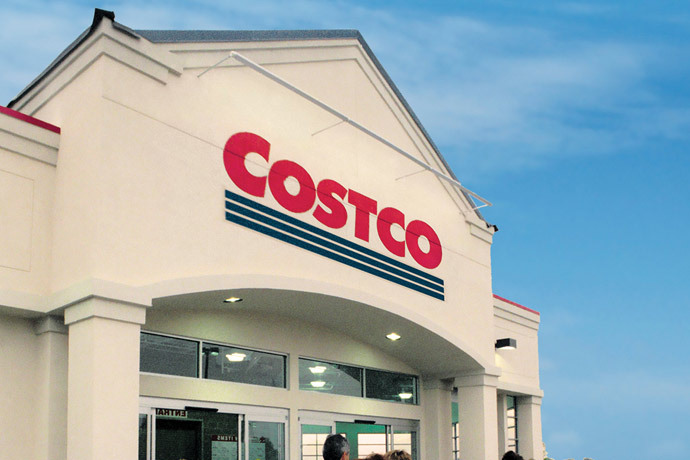 As credit card issuers grow their portfolios by concentrating their acquisition efforts on cardholders with higher spend, rewards are necessarily becoming a bigger part of the value proposition. And now, as part of monitoring market activities, CFPB announced that it will review the clarity and transparency of reward disclosures.